The Art of Change Leadership demystifies the psychology behind our reactions to change and offers a powerful collection of tools to inspire individual and collective transformation quickly and more effectively, explains author of the book, Cheryl Cran. Leverage your current technical knowledge to increase the rate of innovation. Use the cycle of change to foresee and handle change-related issues affecting yourself, others, and business. Raise your emotional intelligence to match your IQ. Guide “change” initiatives with repeatable success by using the reliable three-step change model. Cran also explains the differences between a Change Manager and a Change Leader. A Change Manager creates a plan, directs projects and people to achieve a goal. In contrast, a Change Leader sets the compelling vision; tells a story that includes the hero’s journey for each person involved. Provides a project timeline while creating celebration milestones. Connects personally with individuals to “onboard” them to the changes and provides the framework for how the changes will happen. Courageously leads the changes without falter while being open and honest about his or her own fears and challenges along the change journey. Constantly looks to provide added value to the team members by customizing feedback, providing resources and support. Welcomes disruptions and leverages them into new creative solution opportunities for self and for the team. Willingly shares power with others with a depth of confidence and without having the need to protect ego or CYA. Sees the role of a change leader as a facilitator of intelligence and not as the keeper of all knowledge and power. Cran is the CEO of Evolutionary Business Solutions, Inc.
Change is inevitable. Change is good. Help your employees and team learn to embrace change. The kind of behavior change that results in lasting (sustainable) change must accommodate people’s feelings–feelings that involve trust, confidence, passion, and all those other intangible but very real things that make us human. It’s often the stress that people resist, not the change itself. Continuity gives us roots; change gives us branches, letting us stretch and grow and reach new heights (Pauline R. Kezer). A transformational leader focuses primarily on initiating and “managing” change. He/she influences people to improve, to stretch, and to redefine what’s possible. It is not the strongest of the species that survive, nor the most intelligent, but the one most responsive to change (Charles Darwin). 1. Explain how the change will make employees feel before, during and after the implementation. 2. Explain the tactical plan and goals. 3. Answer questions from your team. 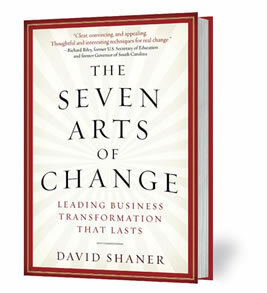 David Shaner’s compelling, The Seven Arts of Change, shows business leaders that transforming a business only happens when each employee equates organizational change with the process of deep personal growth. “The bottom line is that, despite how technological and automated organizations have become, at their core they remain a collection of human energies that are merely being applied in an organized environment,” explains Shaner. “Resurrecting and guiding that human core of your organization is the secret to leading and sustaining change,” he adds. Even if you don’t fully appreciate his blending of Western business savvy with Eastern philosophy, the 184-page book, readable in an afternoon, is pertinent and timely. 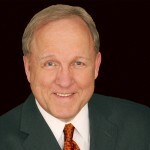 Most important, he teaches business leaders and nonprofit executive directors why they need to change the way they lead change. Most leaders miss the fact that every employee possesses a latent willingness to change. Leaders often ignore the fact that personal progress is one of our strongest human desires. 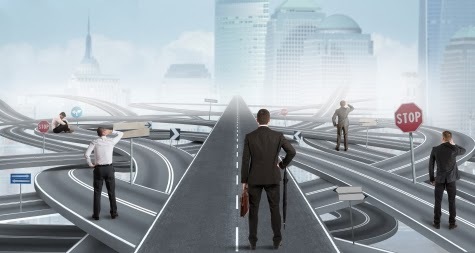 Your job as the leader is to connect the new business need with an opportunity for personal progress. Organizations that evidence compassion listen to each other in order to understand and connect to more effective outcomes, not in order to place blame or assert their own way of doing things. Listening is the root of collaboration, root-cause analysis, and effective teamwork. It is also the single greatest source of establishing unity from top to bottom and bottom to top. Regardless of the conditions surrounding your change, your employees will perform to the peak of their ability if they are driven from a collective inner strength brought on by clarity of purpose, focus of requirements, and visibility of progress. Your employees’ daily actions must be consciously meaningful to both the business initiative as well as to them personally. 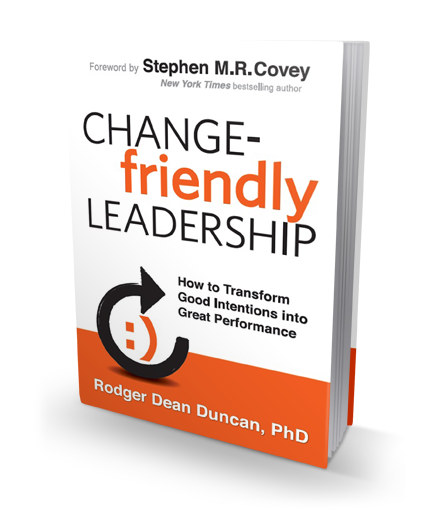 Because Dr. Rodger Dean Duncan delivers so much timely, straight-forward and relevant wisdom in his book, Change-friendly Leadership, reading it is like talking with your trusted best friend. Or, listening to your favorite teacher. Or, soaking in the thoughts from your respected mentor. That’s why you’ll want to spend plenty of time reading the book. Reflecting on the messages. Absorbing the discussion, And, then likely re-reading it. Or, at least certain sections. Duncan demonstrates in the book how humanness, approachability, and friendliness are necessary but often overlooked elements of making change successful in an organization. He teaches leaders the foundation for effectively engaging people’s heads, hearts and hopes — all necessary to enable effective and lasting (sustainable) change in today’s constantly changing world. Duncan refers to this as leading the whole person. Change must accommodate people’s feelings–feelings that involve trust, confidence, passion, and all those other intangible but very real things that make us human. Duncan’s change-friendly leadership approach includes knowing how to leverage the Champions, Agents, Sponsors and Targets within your organization. And, how to combine tough love elements into the process while always operating from a platform of respect and caring, not intimidation and contention. Readers will appreciate the “Bonus Points” offerings at the end of each major section of the book where they learn how to access free white papers, diagnostic tools, videos and other items by going to a URL or using a QR code via their Smart phone. Losing good people is costly. But the number one most expensive thing that can happen to your organization is for your best and most capable people to quit and stay. A transactional leader focuses on routine and regimented activities. A transformational leader focuses primarily on initiating and “managing” change. It is not the strongest of the species that survive, not the most intelligent, but the one most responsive to change — Charles Darwin. Amateurs practice until they get it right. Professionals practice until they can’t get it wrong.